Last night I went down to the Algonquin Theatre on East 24th for a play reading. I was invited by my friend Melissa Vogt-Patterson to a reading of her own play "Serendipity" at Cold Cuts. Cold Cuts is presented by Ten Grand Productions. It's a program to bring new unpublished works and actors together without directors. Actors show up with their headshots and resumes and are cast in the play readings. Cold Cuts first began in the living room of one of the team members of Ten Grand Productions and over the years has grown into a open invitation to actors and writers. There's never any charge to participate or just enjoy. I knew my friend Melissa is a talented soul, born to sing and act, but she's kept her writing a hidden talent until now. We only heard the first act, so I'm excited to read and/or hear the second act to see what happens. The first act play is about two friends, a girl and guy, who love each other but aren't in love with each other. They have some relationship hang ups to say the least and are there to help each other out. It's a very funny look at love and being 20-something. Some lines are downright clever and hysterical, and she manages to create words like "sexbidextrous". It was fun witnessing members of the audience come up to Melissa after to congratulate her and wish her well with the next step. The bonus of the evening was meeting Ken Jennings. I walked into the Algonquin with Melissa and her husband Matt Patterson, who by the way is also an actor and the drummer in the terrific power pop band Vine House. Matt called out, "Ken Jennings!" He introduced me to him and added "You know, The Ken Jennings." Yes, I beamed and managed to mutter, "Toby - Sweeney Todd. Nice to meet you." Ken is currently in Sessions, a new musical that's running at the Algonquin Theatre. He is also starting his own acting school. For information on joining his acting classes, contact Ten Grand Productions. 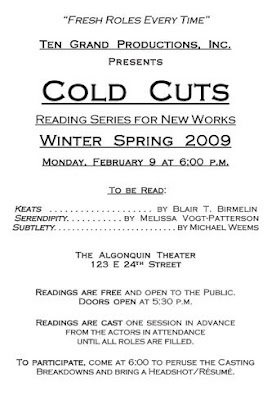 The next Cold Cuts is on Monday, February 23rd, 6:00 pm at the Algonquin Theatre. Take your headshot/resume to be cast for the next reading in March, or just show up for a delightful evening of readings of new works.